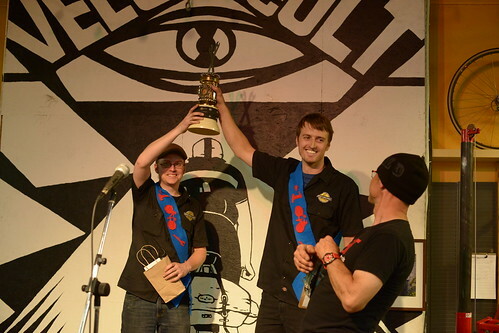 June 16, 2014 – Portland, Ore. – Two mechanics from Bike Gallery—Brian Link and Sterling Hill—took home the trophy at the 2014 Bike Mechanic Challenge, a benefit for the Community Cycling Center. Mechanics from around the city competed in a series of events in front of a packed audience at Velo Cult. A few secret twists surprised participating mechanics during the competition. “The blindfolded tire change kind of came out of left field. I have never tried to do that before. I have never worked with two people on the same bike,” noted Brian Link after winning the competition. Their speedy skills paid off, as they repaired the tire without eye sight at a winning time of 2 minutes and 22 seconds. Bike Gallery faced stiff competition from Velo Cult, City Bikes, Lakeside Bicycles, Block Bikes, Planet X USA, PSU Bike Hub, Western Bikeworks, and Missing Link. Ultimately, it was Brian and Sterling’s skill and speed during the first three rounds that led to their final winning score of 95 points. During the final round of the competition, mechanics put together “mystery objects” that were hiding underneath their work stations during the entire competition—ten bikes destined for deserving children through the Community Cycling Center’s programs. Overall, the Bike Mechanic Challenge raised over $11,000, allowing the Cycling Center to provide more people access to bicycles during its 20th anniversary year. Bike Gallery was founded in 1974 with the mission of getting more Portlanders on bikes, and doing it with the best service in town. Forty years later, we have grown to six neighborhood stores while remaining a family-owned business with deep roots in the community. We are dedicated to connecting Portlanders with bicycles for a healthier and inspired life – two wheels style! Whether it is family rides, commuting to work by bike, racing bikes, or getting out to the mountain on two wheels, Bike Gallery is your Bicycle Store. ###More photos from the event can be found here.